Have a conversation with your toddler. Listen to and repeat what your child says indicating that you understand. Build and expand on what was said. "You want more juice? What kind of juice do you want?” This allows your child to comprehend conversational turn taking, but also questioning skills. Ask many questions that require a yes or no answer or a choice. " Do you like your new blue shirt?” “Do you want an apple or an orange?" "Do you want to wear your red or blue shirt?" Questioning skills are always a great communication skills and oral language builders. Toddlers love to hear words. 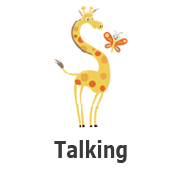 Talk all the time to expand vocabulary, oral language skills and conversation skills. Tell your toddler stories, nursery rhymes and fairy tales. These provide great memories as well as build upon literacy skills.